Department of Pathology and Laboratory Medicine, Perelman School of Medicine, University of Pennsylvania, Philadelphia, Pennsylvania, USA. Address correspondence to: Frank S. Lee, Department of Pathology and Laboratory Medicine, Perelman School of Medicine, University of Pennsylvania, 605 Stellar Chance Labs, 422 Curie Blvd., Philadelphia, Pennsylvania 19104, USA. Phone: 215.898.4701; Email: franklee@pennmedicine.upenn.edu. J Clin Invest. 2019;129(1):72–74. https://doi.org/10.1172/JCI125509. Hepcidin is the master regulator of iron metabolism. 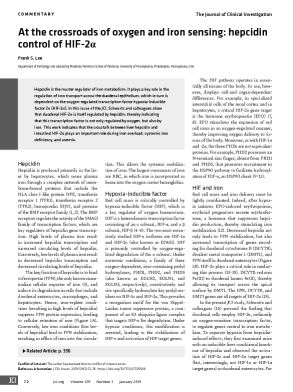 It plays a key role in the regulation of iron transport across the duodenal epithelium, which in turn is dependent on the oxygen-regulated transcription factor hypoxia-inducible factor 2α (HIF-2α). In this issue of the JCI, Schwartz and colleagues show that duodenal HIF-2α is itself regulated by hepcidin, thereby indicating that this transcription factor is not only regulated by oxygen, but also by iron. This work indicates that the crosstalk between liver hepcidin and intestinal HIF-2α plays an important role during iron overload, systemic iron deficiency, and anemia.